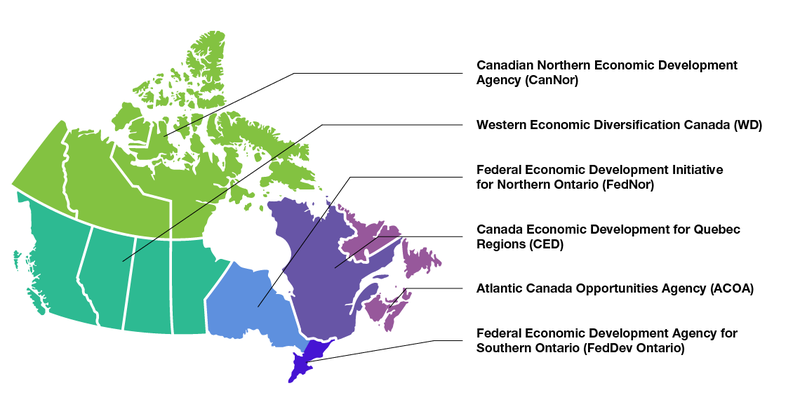 Canada's Regional Development Agencies (RDA) work closely with businesses and innovators in their regions to fuel economic growth that creates more well-paying middle-class jobs for Canadians. Helping businesses in Atlantic Canada to become more competitive, innovative and productive. Guiding Quebec businesses and regions toward the economy of tomorrow. Helping to develop a diversified, sustainable, and dynamic economy across Canada's three territories. Programs and services to support innovation and economic growth in southern Ontario. Supporting businesses and community partners to build a stronger Northern Ontario. Diversifying the western economy while improving the quality of life of western Canadians. RDA programs foster the right environment to enable businesses to grow and entrepreneurs and innovators to start businesses, creating the ideal conditions for the development of strong, dynamic and inclusive regional economies throughout the country. "Innovation drives economic growth across Canada. Our regional development agencies are there to help businesses and innovators grow, succeed and create good jobs for Canadians." Businesses and industries in communities across the country are thriving thanks to targeted investments from the RDAs. Blue Roof Distillers developed a one-of-a-kind method of distilling potatoes from their farm as an alternative to having to throw away those that are too small to sell in stores. With the recent investment of $100,000 from ACOA, Blue Roof Distillers was able to purchase specialized small-scale equipment to not only solve this issue but also support its continued business growth. With assistance from CED, Indigenous woman-owned business Atikuss was able to expand its operations offices and warehouse, optimize its production line and create a new line of luxury products. Ms. Leblanc, the owner of Atikuss, is giving Indigenous women an opportunity to share their ancestral beadwork tradition and, most importantly, to make a decent living. Investments made by the Government of Canada assisted in the development of the NorthLight Innovation building. This hub will support an ecosystem of innovation in Yukon and will provide community businesses with access to the people and tools they need in Canada's rapidly growing innovation network. A federal investment of $275,000 through the Canada 150 Community Infrastructure Program went toward upgrading Canada's oldest railway tunnel: the Brockville Railway Tunnel. Improvements included repairing the tunnel's drainage system, creating a concrete travel surface, repairing masonry and stabilizing rock, and installing new lighting and ventilation systems. This project has created a safer and more accessible experience for visitors. NADF is a not-for-profit Aboriginal organization that provides business financing, community economic development resources and business counselling services to First Nation and Metis people across northern Ontario. In 2013, a $4.4-million investment through FedNor contributed to, among other things, the development of a toolkit to assist northern Ontario Indigenous communities to make positive changes through Comprehensive Community Planning (CCP) that empowers community members. Sport has always been a passion for Canadian Olympic soccer star Karina LeBlanc. Now, thanks to a $500,000 investment from the Canada 150 Community Infrastructure Program, she can share that passion with the next generation of Canadian athletes. This funding supported the creation of a park in her name in her hometown of Maple Ridge, B.C. The Karina LeBlanc Field is more than an economic investment; it is an investment in the quality of life of all residents of Maple Ridge. It serves as a reminder of what people can achieve through hard work and determination.